There’s no denying it, winter is on the way. But you don’t have to suffer through good-egg withdrawal this winter, our winter egg CSA is back! 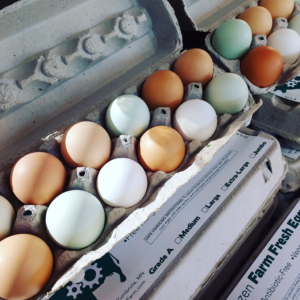 Join the winter egg CSA to lock in your supply of farm fresh eggs all through the cold months. You’ll share in the seasonal swings of outdoor egg production, from the new-year doldrums, to the heady heights of a new spring laying cycle. Sorry! Our CSA shares are all sold out for the 2019 season!